He’s not a young wizard with a flashy scar, he’s not a little hobbit with a big mission—he’s Napoleon Dynamite, an awkward teenager from Preston, Idaho, with afro red hair and a skewed perception of reality. And he’s making a splash in the film world. 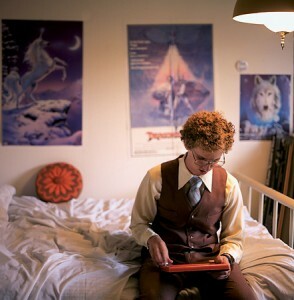 With 22 days and a $200,000 budget, a number of current and former BYU students, working alongside Hollywood professionals, set out last summer to make Napoleon Dynamite, a movie about a rural high-school boy dealing with typical high-school challenges, including getting a date for the high school dance and helping his friend run for class president. Sound cliché? Sundance didn’t think so. The movie, which was directed by former BYU student Jared L. Hess and stars current student Jon J. Heder, ’04, was accepted into the prestigious film festival, where it busted up both critics, who have described it as “gloriously quirky,” and audiences, who snatched up all tickets to every showing. But the success story doesn’t end there. Fox Searchlight, an independent arm of Twentieth Century Fox, which has released such films as Bend it Like Beckham and In America, purchased the movie for $3 million and plans to distribute it to theaters across the country later this year. The unpretentious Hess, who based the comedy in part on his experiences growing up in Preston, says he “about dropped the phone” when he found out the film was accepted into Sundance. In Napoleon Dynamite, John Heder plays a quirky teenager from Preston, Idaho. The film made audience smile at Sundance and was later purchased by Fox Searchlight for $3 million. Photo by Seth Smoot. Jerusha, who doubled as costume designer on the set, was less shocked by the film’s initial success. What has surprised many of those involved with the project is that such a clean film—although everyone is quick to point out that it isn’t a typical “Mormon movie”—has received such wide acclaim with diverse audiences.